Close-up of the commemorative plaque on its stone base. The Polish text reads “IN MEMORY OF THE MILLIONS OF JEWS MARTYRS AND FIGHTERS EXTERMINATED AT THE AUSCHWITZ- BIRKENAU CAMP BY THE HITLERIAN RACE MURDERERS, 1940-1945.” The Hebrew texts have the same meaning. The dates 1940-1945 refer to the deaths throughout the camp and not specifically in this Krematorium which worked only in 1943 and 1944. Note the seven-branch candelabras engraved on the stones at the bottom corners of the plaque. This memorial was subsequently removed. 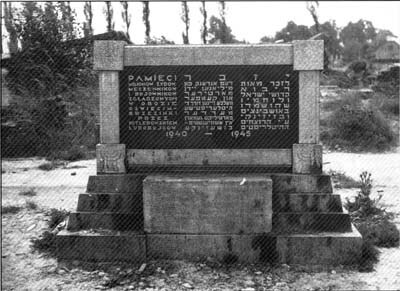 The first monument erected at the end of the ramp between Krematorien II and III. View of its western face. The second was to be erected further to the west. In the background, the main entrance to the Birkenau camp, with to the right B.I and to the left B.II. 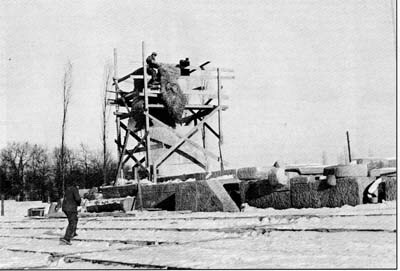 The construction, during the winter of 1963-64, of the second Birkenau monument, a collective work by Pietro Cascello, Giorgio Simonici, Jerzy Jarnuskiewicz and Julian Palka. It's title: “International monument to the victims of Fascism”, typical of the phraseology of the People's Republics, is absurd. Perhaps more appropriate would be “INTERNATIONAL MONUMENT TO THE VICTIMS OF HUMAN FOLLY”. 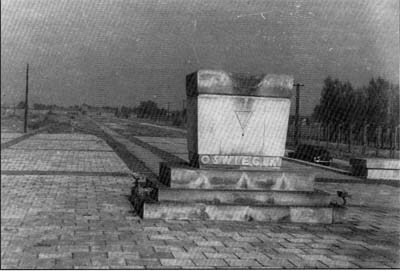 View of the second Birkenau monument, taken on the same day as the preceding one, on a west/east line. 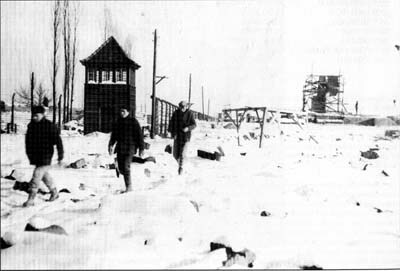 This photograph, taken in the winder of 1963-64, was presented on page 53 of the supplement to the “Patriote Résistant” of January 1970, “L'impossible oubli”, under the caption “Auschwitz in 1942"! Its author, knowing nothing about scaffolding methods in that part of the world, had decided after comparing this photograph with one of the construction of the chimney of Krematorium IV in 1943, that this scene too must date from the war.